There are times when you wish deeply you could do something but know you just can't. Just such an occasion happened while flying one of the Commanders of one of the Army's largest artillery bases. "Up Lift" was a huge artillery complex to our north that supplied artillery support to various forces all around it. We called it "Up Lift International" because the radio operator there treated it just like a major US airport with big airliners going in and out. The guy was good and though they only had pads for two choppers he made everyone coming in there feel like he was diverting all kinds of Airliner traffic just so you could get in and land. I was the AC and was suppose to fly the Commander around his AO (Area of Operation) after picking him up at one of the real airports in the area. After we got him on board and got within radio range of Up Lift we were told that we could not land. A sapper had snuck in and set off their big ammo dump and the whole camp was under cover. A fire was now cooking off the rounds. We could easily see people running around trying to get away from the ordnance that was popping off and believe me it was going all over the place. There was really no place to land because the rounds were not just going off they were being blown into the air above and all around the compound and then going off. The rounds were even going past the far end of the camp and not just one or two but several at a time and in all directions and it was going to do that for hours to come. Several people died and one had his arm blown off. There were all kinds of wounded down there and here we are watching it all from a safe distance and there was nothing we could do. If I could have gotten down and gotten out a chopper full I would have. It tore their Commander up as well. We circled for as long as we could. I do not remember what we did with their Commander. Wilson Hubbell is but one of many that are now utilizing the Internet to get answers to questions they have. I was recently contacted by Wilson concerning the Up Lift incident and he kindly gave me permission to use his email in conjunction with that particular story. Here is that initial e-mail. Thank you for your report on the ammo dump incident at LZ Uplift. For some time I've looked for more info. on what took place that day and your writings are basically all I've found. I was a Flight Engineer with the 196th ASHC, a Chinook unit based near Qui Nhon. We were on the ground at Uplift waiting for the ARTYs to prepare some slingloads when the explosions began that day. Our pilots had to make a quick decision for the 5 of us to either find a hole someplace or they would try to start the aircraft and fly us out of there. As you can imagine, the start-up procedure for a Chinook does not occur all that quickly - especially when, like our pilots, the process takes place facing a pile of exploding 105 rounds. They were successful (!) and we launched to slowly - and lowly - fly away from the place so that all the crap now flying through the air could not bring us down at an altitude or air speed we could not survive. Once safely clear of the LZ we gained altitude and looked down to see the scene that you described - explosions everywhere and some guys trapped between the concertina wire and the ammo cooking off. There was nothing we could do about it and that memory haunts me to this day. I never knew what sort of casualties were sustained or that sappers caused the attack (broad daylight! ), all I knew was that we got away and could not do a damn thing to help. 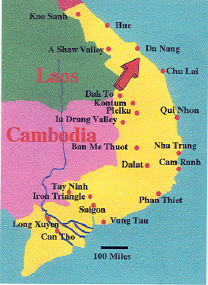 I returned to Vietnam in 1995 and 1998 to travel from Hanoi to Saigon by bicycle. As you may recall, Hwy 1 is immediately adjacent to the site of Uplift and I took the opportunity to visit the place once again. I left a First Aviation Brigade shoulder patch in the branches of a tree there so that the souls of our brothers would know that they are not forgotten - and we did return. If you can provide me with any info on the date of the incident or the unit(s) involved I would really appreciate it. There are names on the Wall I'd like to find.